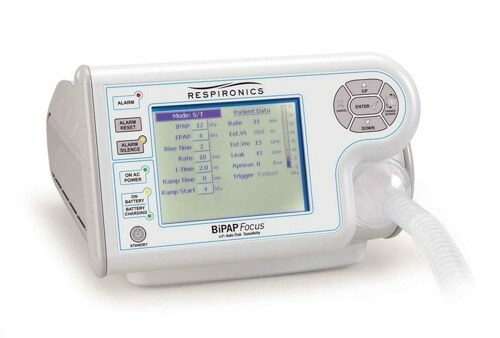 The BiPAP Focus supports staff efficiency and patient safety while delivering reliable NIV. Digital Auto-Trak provides auto-adaptive triggering and cycling thresholds. The large screen makes it easy to access settings and alarms. Other safety features include nurse call, adjustable alarm volumes, and backup battery. The BiPAP Focus is a true hospital-grade ventilatory assistance system, which is suitable for obstructive sleep apnea (OSA), low-acuity, and respiratory insufficiency patients. The BiPAP Focus delivers dependable NIV in general wards and other non-critical-care settings where NIV is gaining popularity. The BiPAP Focus is compact and lightweight, and the integral 3.8-amp-hour backup battery allows uninterrupted ventilatory care.